Doug Burnett, city attorney for St. Augustine Beach, announced his resignation during Monday night’s commission meeting. Burnett, who served as the city attorney for 6½ years, said his growing law firm, St. Johns Law Group, is making it challenging for him to juggle responsibilities, both to the firm and to the city. 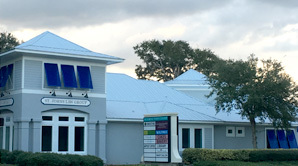 The old building, which was located on Anastasia Boulevard, was filled to capacity, so the firm couldn’t hire new lawyers for the last two years. But the new location, in Sea Grove Plaza, will allow him to expand, he said. “The construction of a new building and significant expansion of our client base and staff put added demand on my time as we face ever increasing challenges of administrative oversight and client service,” Burnett wrote in his resignation letter addressed to City Manager Max Royle and Beach Police Chief Robert Hardwick. The resignation includes the legal services of the entire law firm, including James Whitehouse who has represented St. Johns Law Group at some commission meetings. “It’s bittersweet, I will say; I’ve enjoyed being the city attorney. It’s been a neat process to see what’s gone on in the city in the last 6½ years, and to see leadership from city staff and the job (they’ve) done to position the city for the future,” Burnett said. “St. Augustine Beach has earned the trust of its residents and respect of our community — a model of emulation for similar size cities in Florida,” the resignation letter said. Burnett said he will continue to provide his services to the city until a replacement law firm is hired. The Beach will start advertising for a new law firm in December and will discuss applicants at the January meeting, Royle said. “The commission will discuss who they want to interview then,” Royle said. But Mayor Andrea Samuels said whoever is hired will have big shoes to fill. Commissioner S. Gary Snodgrass added: “You and your colleagues have been outstanding in every way and provided resources, insight and intellectual rigor to this whole process. “I appreciate all your behind-the-scenes counsel, advice and suggestions, particularly when I was mayor during a tough couple of years,” he said. It has been a distinct honor and privilege to have served as City Attorney for the City of St. Augustine Beach for the past six years. During this time, I have observed the elected and appointed leaders of St. Augustine Beach adapt to change, implement good governance, position the City for the future, and establish a new standard for transparency. St. Augustine Beach has earned the trust of its residents and respect of our community—a model of emulation for similar size cities in Florida. Over the past six years, I have also seen the City become less litigious and establish new norms concerning legal matters. Committed leadership has been the centerpiece of this progress. As I have stated publicly, I have enjoyed the opportunity to represent the City in legal matters and personally take pride in being part of the team that has created a culture of excellence. My law firm, St. Johns Law Group, has also enjoyed significant growth during this period making it ever more challenging for me to juggle responsibilities of leadership of the firm and support of my employees and clients. The construction of a new building and significant expansion of our client base and staff put added demand on my time as we face ever increasing challenges of administrative oversight and client service. Additionally, I place a very high priority on commitment to family both personally, and for the lawyers and staff at the firm. After careful thought and personal reflection, I must give my notice of intent to resign as City Attorney with this resignation applying to my law firm and all of the attorneys who work for St. Johns Law Group. I would respectfully suggest my resignation take effect upon the City retaining a suitable replacement attorney or law firm. Hopefully, this can be done in the near term and not exceed 60 days. Again, it has truly been an honor to serve the City of St. Augustine Beach. I am especially appreciative of the steadfast support shown me during my tenure.